Customer segmentation is the practice of dividing a customer base into groups of individuals that are similar in specific ways relevant to marketing, such as age, gender, interests, spending habits, and so on. Using segmentation allows companies to target groups effectively, and allocate marketing resources to best effect. We already have a few segments there, but lets create a new one. Segment Name (required field) – This is for internal purposes. Description – This is also for internal purposes, and provides an optional space to enter more detailed information than can be contained in the Segment Name. Assigned to Website (required field) – A Customer Segment can only be assigned to one Website, because the conditions can use information that is specific to each Website. 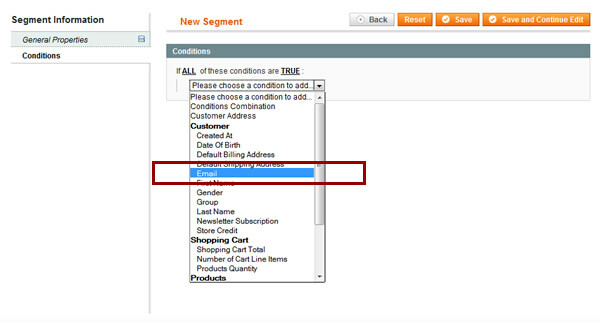 To use the same conditions on multiple Websites, you must create multiple Segments. Status (Active/Inactive) – Select Active to enable this Segment. Price Rules and Banners associated to this Segment can be unassociated by selecting Inactive, without having to edit the Price Rule or Banners. Now we create a simple rule, select all registered customers with specific company email address. Now we have Customer Segment, later we will use it to create targeted and more personalized selling campaigns. If you need any help regarding the marketing of your Magento store, feel free to get in touch. 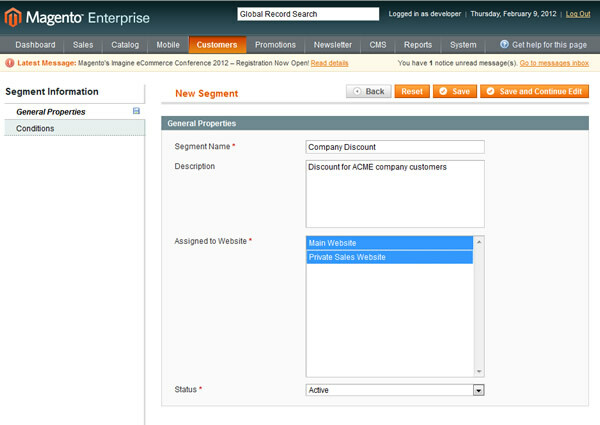 Yep, also one of Magento Enterprise features. Are customer attributes part of the merchandising suite? Is this only available in the Enterprise edition? Can it work with custom fields?